Secret Memorandum for the Transvaal Executive from Jan Smuts, 4 September 1899. In order to understand the organisation of the Boer forces, one needs to revisit the era of the Voortrekkers. With the frequent wars and skirmishes in the border areas, it was necessary for all able-bodied men to stand together in times of conflict to fend off the ‘enemy’ (my quotation marks) for the benefit of the whole community. There simply wasn’t enough capital for a regular army, yet the need for some type of military organisation was obvious. To satisfy this need a Commando system evolved. In essence it meant that every able-bodied male who could handle a firearm had to be prepared to render assistance in times of war. Laws were passed to regulate these citizen-soldiers. Officers were elected to organise and administer the system, and by the time of the War the Commandos, though seemingly quite disorderly, were in fact reasonably well-organised. The Commando laws of the South African Republic and the Orange Free State were generally very similar. In the Z.A.R. all European males between the ages of 16 and 60 were eligible for military service. Persons of colour who were able to do duty could also be called up. The rest of the population was required to assist in any way they could. The Orange Free State also required that all males between the ages of 16 and 60, who had no valid excuse, be prepared to do duty. Every burgher was expected to be ready to go to war at any time, and at all times had to be in possession of, amongst other things, a serviceable rifle plus 30 rounds of ammunition. Furthermore, Free State citizens who lived on farms were required to have a horse, complete with saddle and bridle. Key personnel in both Republics were exempted from military duties. From the days of the Voortrekkers and early years of the Republics, all burghers were responsible for arming themselves. 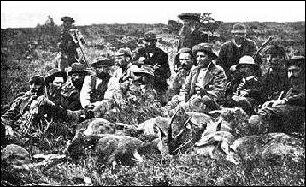 However, later on, the governments of the two Boer Republics made rifles available to their citizens at very reasonable prices and assisted those persons who were financially unable to purchase their own firearms. They were either issued with rifles, which remained the property of the State, or they could purchase a rifle from the State by instalments. Each Republic was divided into Districts. Each District had a Landdrost (Magistrate) who attended to the civil administration of his area and a Commandant who attended to military matters. Districts were divided into Wyke (Wards) with a Field-cornet in charge of each Wyk. In the Z.A.R. some Wards had an Assistant Field-cornet while in the Free State all Wards had Assistant Field-cornet. Major towns in the Free State also had a Field-cornet. Parallels can be drawn with the British army: a Commandant is roughly similar to a Colonel and a Commando similar to a Regiment. A Field-cornetcy with a Field-cornet in charge would correspond to a Company. The Field-cornet approximates a Captain, and an Assistant Field-cornet, a Lieutenant. Bester, Dr. Ron. 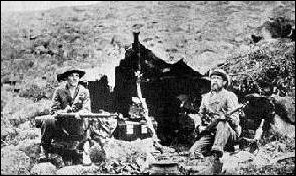 Boer Rifles and Carbines of the Anglo-Boer War. The War Museum of the Boer Republics, Bloemfontein: 1994. The list below illustrates how the Republics were divided into Commando Districts. Bovenwyk, Vaal River, Onderwyk Vaal River, Harts River. Wyk1, Wyk 2, Wyk 3, Wyk 4. Wyk 1, Wyk 2, Wyk 3. Suikerboschrand, Roodekoppen, Klip River, Hoogveld. Wyk 1 (delwery), Wyk 2, Wyk 3. Dorp, Krokodil River, Steenkampsberg, Ohrigstad River. Klein Marico, Groot Marico, Boschveld, Malopo. Dorp, Olifants River, Steenkoolspruit, Seylons River, Mapoch’s Gronden. Dorp, Vaal River, Boven Mooi River. Dorp, Elands River, Bronkhorstspruit, Krokodil River, Witwatersrand, Aapjes River. Elands River, Swartruggens, Hoogeveld, Hex River. Wyk 1, Wyk 2, Wyk 3, Wyk 4. Pietersburg, Marabastad, Renosterpoort, Houtboschberg, Onderveld, Spelonken. There was also a special Commandant for Johannesburg and Field-cornets for the diggings at Barberton, Johannesburg, Lydenburg and Heidelburg, as well as one for Swaziland. Groot River, Bojesspruit, Midden-Modder River. Boven-Modder River, Kaalspruit, Kaffer River, Maroko. Middenveld, Van Zylspruit, Boven-Riet River, Midden-Riet River, Groot River. Midden-Valsch River, Onder-Valsch River, Onder-Rhenoster River. Winburg, Taaiboschspruit, Zand River, Vet River and Onder Wittenberg. Ficksburg, Harrismith, Jacobsdal and Wepener all had one ward each. All officers in the Boer Forces were democratically elected. Even though the officers were backed-up by law to enforce discipline, etc., their rank and election lay in the hands of the men they had to lead. Consequently the men of a Ward elected their own Field-cornet and those of a District their own Commandant. If an officer did not meet the expectations of his men, he could be replaced in a democratic manner. The original Boer horse was never a breed in the truly accepted sense of the word. From the time of Jan van Riebeeck it developed from the originally imported horses of Eastern blood (Arab origin) into a fairly typical South African light-riding-and-harness-horse, well adapted to the South African conditions of rather poor veld pasture and harsh inland climate. 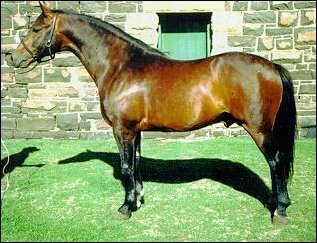 In the 19th and early 20th century locally bred Boer mares were extensively crossed with the Arab, the English Thoroughbred, Hackneys, Roadsters, Cleveland bays and other imported breeds. This led to an even wider diversification of type. When the Boerperd Breeders’ Society was established soon after the Second World War, it was virtually too late to save the ‘original’ Boer horse. Although this was one of the aims of the Society, the modern Boer horse, as registered by the Society, shows a very strong resemblance to the American Saddle-horse. Horses were introduced into Basutoland when the early inhabitants of the mountain kingdom first made contact with Westerners in the first half of the 19th century. The parent stock of the Basuto pony was therefore Boer horses which were at that time almost entirely derived from early Arab and later English Thoroughbred importations. Under the very harsh feeding and climatic conditions of Basutoland and by a process of, to a large extent, natural selection, a small, hardy, sure-footed pony, easy to ride, developed. 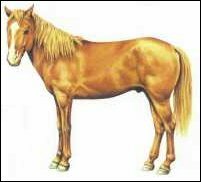 As in the case of the Boer horse, the attempts to save and develop the ‘breed’ came very late. Small studs, where controlled breeding of Basuto ponies is practised, were established in Lesotho and also at the Nooitgedacht experimental station in the district of Ermelo. Transvaal burghers pose while waiting for a train. Boers pose for an official photograph. *Image courtesy of Mr. Piet Steyl. **Image courtesy of Prof. Christo Viljoen. Bester, R. Boer Rifles and Carbines of the Anglo-Boer War. Bloemfontein: Military Museum of the Boer Republics, 1994.